Condé Nast Traveler named Virgin America “Best U.S. Airline” in their 2017 Reader’s Choice Awards for the 10th year in a row this morning. Alaska Airlines took the third spot. Virgin America has taken the top spot in the poll every year since the airline began flying. “This is a celebration of the Best in the World and you are part of it,” the Condé Nast Traveler Team said in the official announcement. The award is especially significant because it’s based on ratings from more than 300,000 readers. Tens of thousands of readers also submit both positive and negative comments about their recent travel experiences of the world’s cities, islands, hotels, resorts, cruise lines, airlines and airports. The award win comes on the heels of Virgin America winning “Top Domestic Airline” in Travel + Leisure Magazine’s World’s Best Awards readers’ survey for a 10th consecutive year in July. In May, Alaska ranked highest in customer satisfaction among traditional carriers in North America, 10 years in a row in the J.D. Power 2018-2017 North America Airline Satisfaction Study. In May, Alaska Airlines ranked highest in airline customer satisfaction among traditional carriers for the tenth consecutive year in the J.D. Power 2008-2017 North America Airline Satisfaction Study. In 2017, both Alaska and Virgin America earned 5-star awards in the APEX Official Airline Rankings. Alaska Airlines received the award in the Major Regional group, and Virgin America in the Low Cost group. In addition to overall rating, Virgin America took home an APEX Passenger Choice Award for Best Seat Comfort. Alaska Airlines ranks No. 1 in the Airline Quality Rating for 2017. 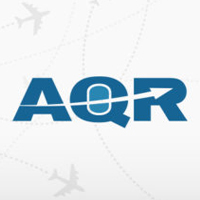 AQR is the most comprehensive study of performance and quality of the largest airlines in the U.S., and ratings are based on mishandled baggage, consumer complaints, on-time performance and involuntary denied boarding. Alaska Airlines ranked highest overall in its 2016 Airline Scorecard. Alaska has received the highest ranking four years in a row. Virgin America ranked No. 3 overall in 2016. Rankings considered on-time arrivals, canceled flights, delays, complaints and mishandled baggage. For the last seven years, Alaska Airlines has ranked as the most on-time North American carrier. To qualify as on-time, each flight must be completed within 15 minutes of its scheduled arrival. Alaska was named one of the top 10 airlines in the world by TripAdvisor.com. 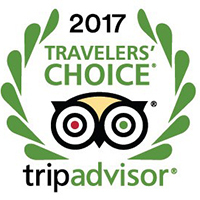 Alaska was one of only two U.S.-based airlines honored through TripAdvisor’s Travelers’ Choice awards. The Points Guy ranked all U.S.-based airlines identifying 10 themes across four major categories: price, convenience, headaches and extras. Alaska Airlines ranked as the top domestic airline, and Virgin America ranked third. 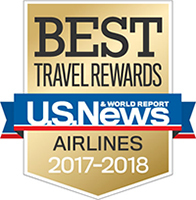 In its annual reader survey, U.S. News and World Report ranked Alaska Mileage Plan as the best airline rewards program, three years in a row. Alaska ranked No. 1 because of its generous elite membership benefits and the ease of redeeming miles for travel. 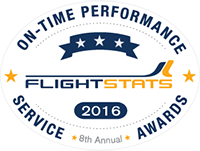 In 2017, Alaska Mileage Plan won the “Best Rewards Program” for carriers in the “Americas” region in the sixth annual FlyerTalk Awards. 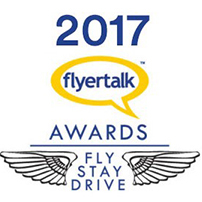 Awards are based on ballots submitted by members of the FlyerTalk online community. 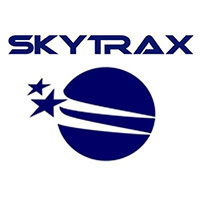 Best airline elite status program in the U.S.
Alaska Mileage Plan was named the best airline elite status program in the U.S. by The Points Guy. According to the study, Alaska Mileage Plan stands apart from the rest by allowing flyers to earn based on miles flown, instead of the price paid for their ticket. 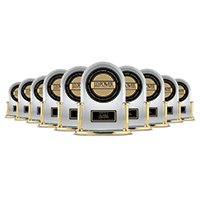 For a full list of Alaska and Virgin America’s awards, click here. 3 comments on "A winning team: Alaska and Virgin America take home top awards in 2017"
Just read through all the changes that you will be implementing to create “a West Coast “ vibe. Very excited about this as I have been an MVP now for several years And when there is a Virgin Flight available I always take it. Overall it’s just a much better experience. It does appear that your not going to keep the seat back entertainment however and I feel this is a mistake. It’s always so much more convenient to not have to rely on your own device. The only request I have is that you add a nonstop flight to New York from SNA. Huge opportunity as there is only 2 daily operated by United. Your partner airline American doesn’t even offer it.